Featuring a witty professional woman as the central character of the old time radio show, Our Miss Brooks was a groundbreaking concept. Audiences could (and continue to) relate to Connie Brooks as a clever, sarcastic, kindhearted teacher. Produced by Larry Berns and written and directed by Al Lewis, Our Miss Brooks premiered on the network on July 19th, 1948. The show was sponsored by Colgate-Palmolive-Peet, promoting Palmolive soap (Palmolive soap, your beauty hope), Lustre Creme shampoo, and Toni hair. The old time radio series continued until 1957, a year after its television life ended. Our Miss Brooks show featured a number of memorable and unique characters, whose trials and tribulations offered zany humor for old time millions of listeners. Critics and fans alike applauded Our Miss Brooks. Radio Mirror magazine nominated Eve Arden as the top-ranking comedienne two years in a row for her portrayal as Miss Brooks. The National Education Association and other teaching organizations awarded Arden for sympathic portrayal of teachers. After the old time radio show Our Miss Brooks ended its run, Eve Arden was offered positions as a High School English teacher at a number of High Schools. 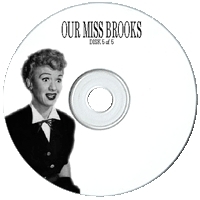 Click here to hear over 190 episodes of classic OUR MISS BROOKS old time radio shows on MP3 CD!